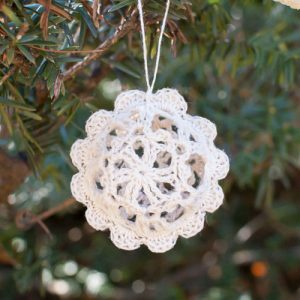 I love the look of lace crochet Christmas ornaments on my tree! I have pretty snowflakes, glittery Stars of Bethlehem, lovely lace crosses, and even some lace ornaments that my grandmother made. 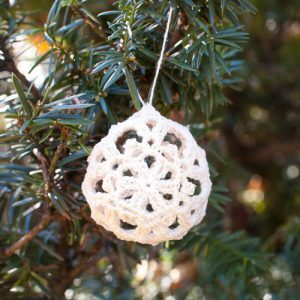 This year I thought I would try some pretty little lace baubles. 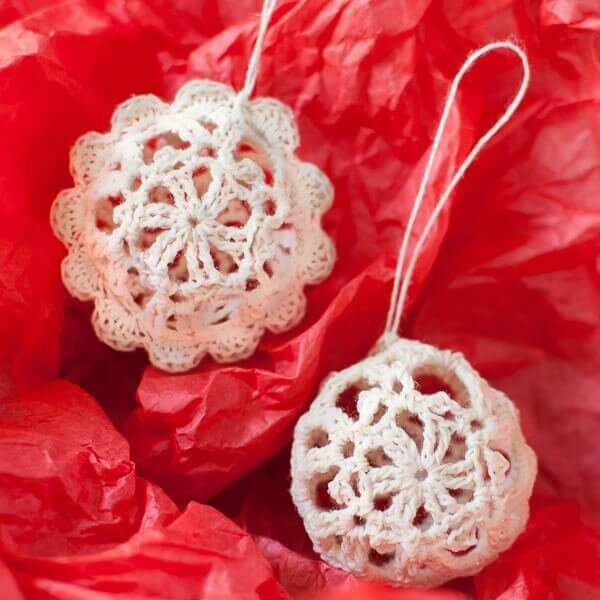 Finished lace crochet Christmas ornaments measure approx 6 in. in circumference. Round 2: Sl st in next tr, *[1 sc, ch 4, 1 sc] in next ch-3 sp, ch 4, work 1 sc in 3rd ch from hook, ch 1, rep from * 5 more times, join in 1st sc — 12 ch-4 loops. Round 4: Sl st in next tr, *[1 sc, ch 4, 1 sc] in next ch-3 sp, rep from * around, join — 12 ch-4 loops. If you want to make just a simple round ornament, make a second half following Rounds 1 through 3 above and then skip down to the Join As You Go Round 4 pattern below. If you want to make the ornament with the scalloped edging, make a second half following Rows 1 through 4 about and then skip down to the Scalloped Edging Pattern below. Round 4: Sl st in next tr, *[1 sc, ch 2, drop loop from hook and pick it up through ch 4 loop of first piece, ch 2, 1 sc] in next ch-3 sp, rep from * over next 10 ch-3 loops, insert the balloon in between piece and inflate just enough to form a sphere that fits comfortably inside your ornament, knot balloon, work last pattern repeat in remaining ch-3 loop, join — 12 ch-4 loops. Round 5 Edging: Join crochet thread in any ch-4 spaces, ch 1 (does not count as st), work [1 sc, 4 dc, 1 sc] in same ch-4 loop and each of the next 10 ch-3 loops, insert the balloon in between piece and inflate just enough to form a sphere that fits comfortably inside your ornament, knot balloon, work last pattern repeat in remaining ch-4 loop, join — 72 sts. 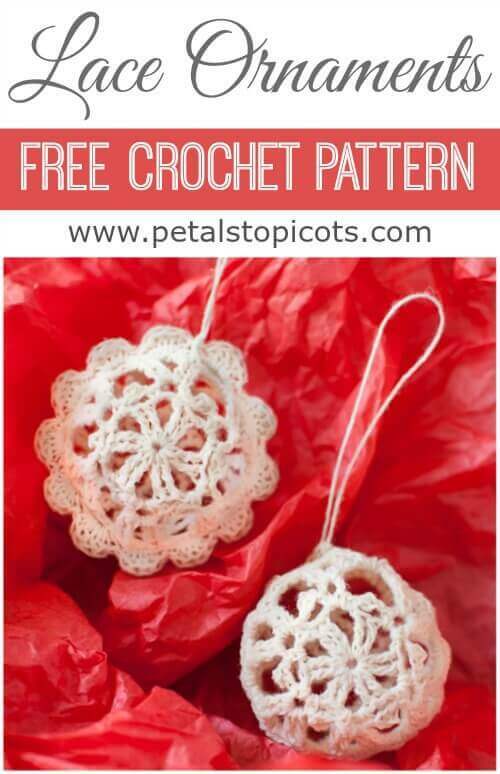 Using a length of crochet thread, add a loop to your ornament for hanging. Using a small paintbrush, apply a thin coat of fabric stiffener over the ornament. Hang until dry or as long as directed on the stiffening product. Once dry, pop the balloon and carefully pull it out. If desired, finish off with a coat of spray glitter (outside!). Previous Post: « Hookin On Hump Day #84 Link Party for the Fiber Arts! Todo estas labores son bellas..amo el tejido admiro todo lo que tenga que ver…Dios bendiga los ojos las manos…de las personas que lo elaboran y el amor con que lo trabajan.muchas bendiciones. . Thank you for these! they are beautiful! Have made one from another pattern – now will make a couple from this one…I have some plain ornaments that desperately need ‘dressing up’! These ornaments are simply elegant!